Join us in the Riverside Annex for the first Free Social Media Workshop on Thursday October 4, starting at 5:00pm. 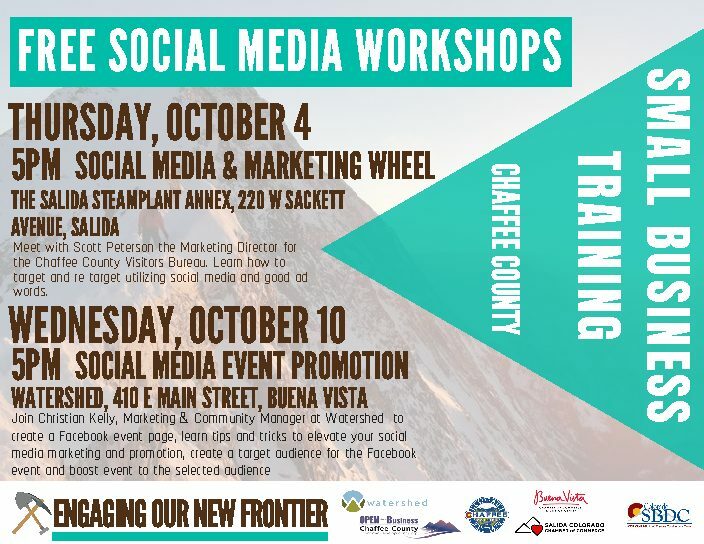 Participants will meet with Scott Peterson, the Marketing Director for the Chaffee County Visitors Bureau. Learn how to target and re-target audiences, using social media and good ad words. Chaffee County and the Chaffee County Economic Development Corporation (CCEDC) have been awarded two grants from the State of Colorado totaling over $30,000 to support entrepreneurs and businesses. The Certified Small Business Community award also designates Chaffee County as a “Certified Small Business Community” along with signs that will announce the County as supportive of small business. The key effort will be to promote the Small Business Development Center (SBDC) and its resources which are available to small businesses and entrepreneurs. Counseling and technical assistance for marketing and business plan development are among the services the SBDC counselors, Shawn Allison and Susan Dunn, are able to provide. Shawn is located at the Touber Building in Salida, and Susan is available by appointment in Buena Vista. This grant awarded in the amount of $12,000. The Rural Economic Development Initiative (RED) grant for $21,000 will allow for greater access to the Small Business Development Center offices in Salida, provide for business “meet-ups,” and train businesses in “lean management”—continuous quality improvement process that allows for a better customer experience. The CCEDC will be seeking businesses to participate. Any business wanting to become more efficient and customer-focused should contact the CCEDC at 719-207-0801 or Wendell @chaffeecountyedc.com. Additional information regarding both programs can be found at the CCEDC website, chaffeecountyedc.com. Both grant awards build upon Chaffee County and the CCEDC’s efforts to foster small business and entrepreneurship, which were highlighted this spring with the Entrepreneur Boot Camp, Access to Capital and Education Forum, and Bull Ring event co-sponsored by the AARP and High Country Bank. The CCEDC, in partnership with Watershed, an entrepreneur-focused shared space in Buena Vista, is recognizing the new frontier of engagement by celebrating entrepreneurship and small businesses throughout the County. The goal is to offer a variety of services, support, and engagement through the Chambers of Commerce, Watershed, the Small Business Development Center, and the CCEDC. The Salida Business Alliance is also participating in the collaboration and partnership. The grants, in particular the Certified Small Business Community Grant, positively respond to several of the recommendations from the Chaffee County Envision Project.